Erwin Rommel was undoubtedly one of the finest generals of the Second World War, his strategic mind and patient approach led his men to victory after victory early in the war. But, while his fame and glory came as a General and Field Marshal, it was as a Lieutenant in the First World War that he earned his greatest honor. Erwin Rommel in 1917, proudly displaying his newly acquired Pour le Merite. Rommel started out the war in command of a reserve artillery company but immediately transferred to the 124th Infantry regiment. By the middle of August 1914, he was in contact with the French, and showed his daring and genius in combat. The II Battalion, to which Rommel’s platoon was attached, halted at Bleid, a small French farming town. They sent out scouting parties, testing the various hedgerows and farms for French resistance. Taking just three men from his platoon Rommel advanced to the edge of the town, where they found 15 French soldiers taking a nervous breakfast in the dense fog. Rather than retrieving his full platoon and assaulting, Rommel gave the order to open fire, and this four man party scattered the French troops, killing 5 of them. After receiving a stiff bout of rifle fire in response, he and his men returned to their platoon, then advanced with the rest of the battalion. Leading from the front, Rommel took the first two houses in the town, preventing an immediate ambush as the battalion moved in. In about an hour the town was cleared. While Bleid was at best a sideshow compared to the main assaults happening up and down the French and German frontier, it showcased Rommel’s surprising skill in small infantry attacks. He led from the front, read any situation almost instantaneously, and made bold but effective decisions. These traits would serve him well throughout the war. After charging single-handed against 3 French soldiers in September 1914, he was wounded in the leg and hospitalized for three months. For this action, he was awarded his first Iron Cross. When he finally returned, the war had drastically changed, gone were the days of free infantry advance, the trench was now the rule. But this didn’t deter his daring or skill in combat. And in January 1915 he distinguished himself again. He and 50 men pushed through a section of the Argonne forest after charging through heavy French rifle fire. Coming out the other side they were at the base of a hill which overlooked the French lines to the south. Winding their way through a break the barbed wire, they forced the enemy out of their position, but Rommel immediately realized a mistake. The position was open to attack from the rear, and the ground was too hard for his men to dig their own defensive line. They quickly moved to an abandoned French blockhouse to their north. Taking a more defensible position there, they held off French counter attacks. Keeping up a steady fire, they held the French back but quickly diminished their own ammunition. When they received word that no relief, or resupply, was coming, Rommel knew that they would have to leave this new position. He identified three options. 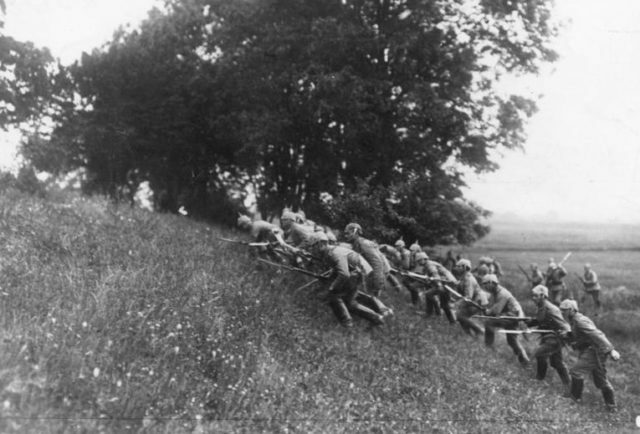 Option 1: retreat the way they had come, pulling back through the wire under heavy French fire. This would lead to high casualties and no guarantee of success. Option 2: continue firing, until every magazine, pouch, and chamber was empty, then wave the white flag of surrender. This, again, had no guarantee of success, the French might not respect the conventions of gentlemanly warfare, and no one wanted to spend years in a prisoner of war camp. He chose a third option: fix bayonets and charge! This could scatter the enemy, giving him just enough time to beat a hasty retreat. This worked, and his men safely returned to their lines. 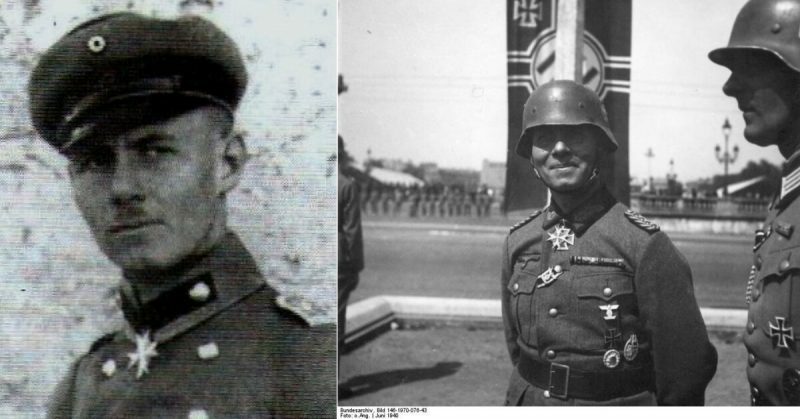 Rommel was awarded the Iron Cross 1st Class and gained the respect and adoration of his men. Field positions for the German Alpine Corps, to which the Wurtemburg Mountain Troops were attached. As the war trudged on, the Italian front opened up, and Rommel was moved there with the Royal Wurttemberg Mountain Battalion. These were the elite of the German infantry, trained in small group tactics, and dedicated to the ideals of careful, thought out, and incredibly violent attacks. Rommel was with troops who fought and thought like him, and he would lead them to great success. Between the 24th and 27th October, 1917, now an Oberleutnant, Rommel led some of the most successful attacks of his entire life. He was tasked with taking Italian positions high on Mt. Matajur. 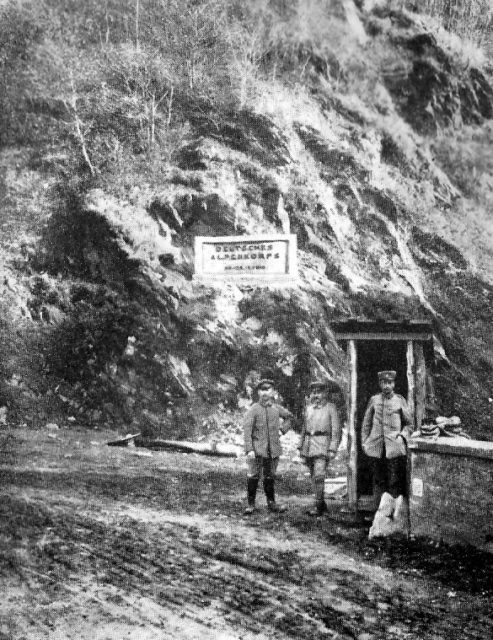 On the 25th his men moved out at first light, snaking their way up Kolovrat ridge, and found that the Italians were hunkered down in their trenches, ignoring a Bavarian company’s assault on neighboring positions. Rommel hid his men only 200 yards from the enemy, and sending out scouts found a pass behind their lines. His men followed him through, and they jumped into the Italian positions from the rear, taking hundreds of prisoners in a matter of minutes. But the Italians counter-attacked, and rifle fire rained down from positions above Kolovrat. 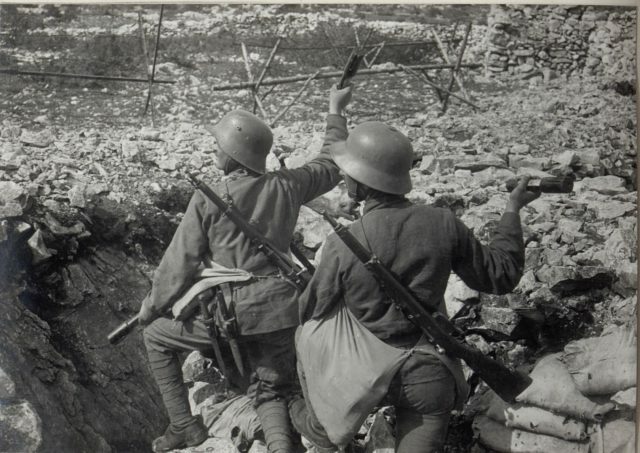 German troops assaulting Italian positions in the Italian front, 1917. Rommel knew that defense was out of the question, and he would have to do what he did best: attack using terrain to his advantage. Leaving his 1st and 2nd companies, and his machine guns to provide suppressing fire, he moved his 3rd company into a hidden position near the enemy’s lines. The Italians assaulted the 2nd Company, but as they approached Rommel’s 3rd company jumped up and counter-attacked. Stunned, the Italians turned to face him, but at that moment the 2nd company charged their now exposed flank. The entire Italian force surrendered, totaling 12 officers and 500 men, their prisoner count was now around 1,500. 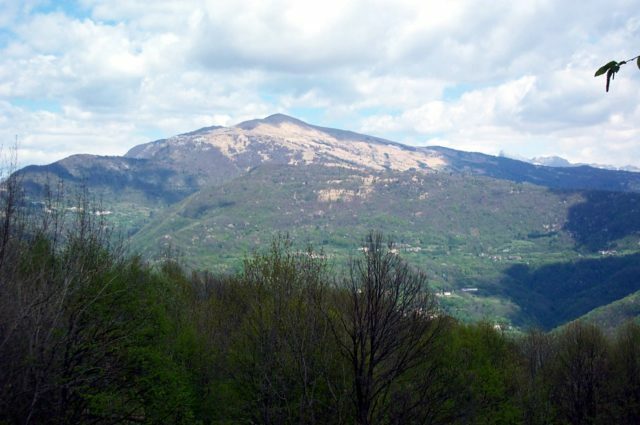 He then found the supply road down the back of the ridge, leading to a village full of Italian reserve troops, supply trucks, food, and officers. Rommel pushed down, with only 150 men, and scattered the defenders, taking even more prisoners. He was then attacked by an Italian light infantry column. After 10 minutes of stiff fighting, the Italians surrendered, likely assuming that their entire defensive line had collapsed. Rommel had just taken another 2,000 prisoners, bringing the count to 3,500 in a single day. But Rommel wasn’t done. 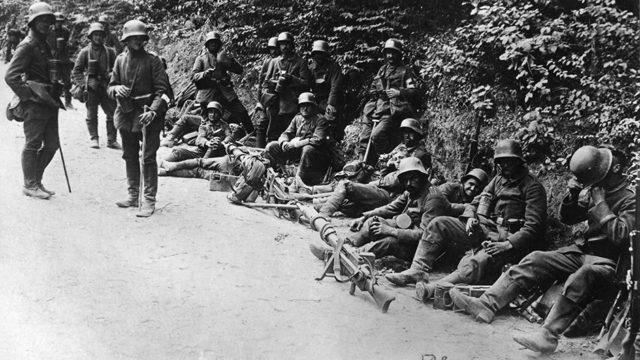 German assault troops rest during the fighting around Matajur in October, 1917. The fighting in the region was fast moving, and intense. Both sides had to use cover, terrain, and surprise if they wanted to make any advances. Mt. Matajur remained his final goal, and he approached the night before, taking a small village, and 1,600 prisoners along the way. When they got up to the Matajur road, and within only a few kilometers of the peak, something amazing happened. 1,500 Italian troops surrendered at the mere sight of these German soldiers, with hardly a shot fired. But now he was ordered to return to refit. Knowing this was a mistake, he pressed for the final assault. Mout Matajur today, Rommel’s men advanced up the series of peaks to the summit over 52 hours of climbing, crawling, fighting, and sprinting. With Matajur only a few hundred meters away, his machine guns kept a suppressing fire on the peak, while Rommel led a handful of infantry crawling, climbing, and bounding up the side of the mountain. But when he arrived, he didn’t need to fire a shot. The Italian commander surrendered, having seen every single defensive line collapse before him he knew fighting was useless, the battle had been lost. All told, Rommel’s men, over 52 hours of continuous combat had taken 18 miles of Italian territory, climbed 2 miles up mountains, captured a grand total of around 9,000 men, and had lost only six dead, and 30 wounded. 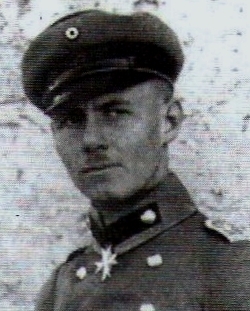 Rommel received an honorable mention in dispatches that day, and was later awarded the Pour le Mérite, Imperial Germany’s highest military honor. It was almost unheard of for this to be awarded to a mere Lieutenant. 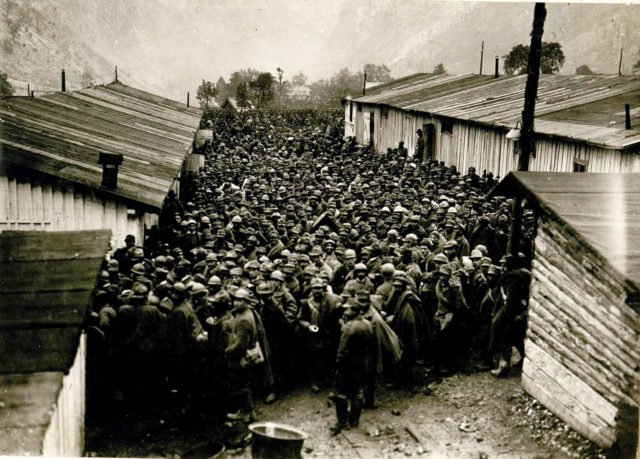 The Italian Prisoners of War after the Battle of Caporetto. 9,000 of these men were taken by Oberleutnant Rommel and his men. 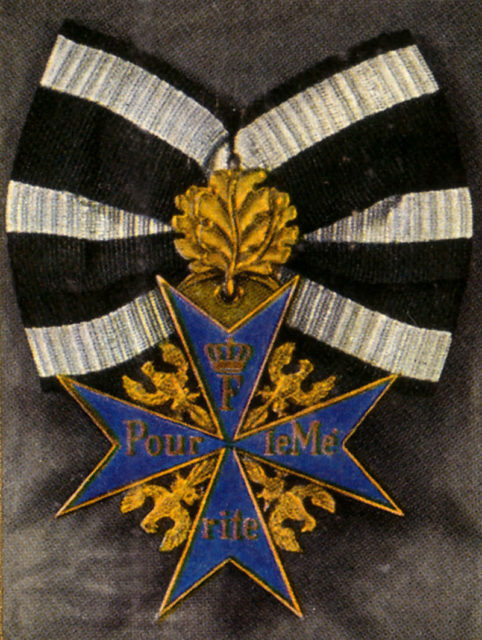 The Pour le Merite, Germany’s Highest Military Honor. It was an incredibly rare thing to see it awarded to anyone below a General. Being awarded to a lowly Lieutenant in the Field was outright amazing. Rommel’s amazing battle skills were honed in the First World War, and one can see his genius approach to combat from the very beginning. He understood terrain, and used every nook and cranny to his advantage. As he would always say “shed sweat, not blood” he would often take the most difficult approach to an objective, if it meant that it might save his men from enemy fire. He demanded courage and dedication from his men, but always returned the favor.